The Original Play Station will have always a big place in History as one of the best consoles that have existed ever. Not just as a technological revolution in its time, but for its interesting and large catalog of games. Among itstitles, special mention deserves the saga of Tomb Raider, also playable for PC, one of the most famous video game franchise whose protagonist, Lara Croft is one of the best characters ever created. Tomb Raider was one of those games that marked a milestone. First for daring to feature an adventurous girl rather than a big man. Second, because the game was full quality on all four corners. Its impossible jumps, some costing hours solving puzzles and deadly enemies around -the third level changed the mind of a lot of people-, have made Tomb Raider, one of the sagas with more value today. While it was necessary to do a reboot of the series recently, the first Tomb Raider games are a classic among classics. And so now you can enjoy the original Tomb Raider, thanks to Square Enix, making specialist ports for Android, and offering this magnificent game for download from Google Play. Features: Epic Exploration: discover the deepest, darkest mysteries of the lost city of Atlantis and unearth secrets to Lara’s past. 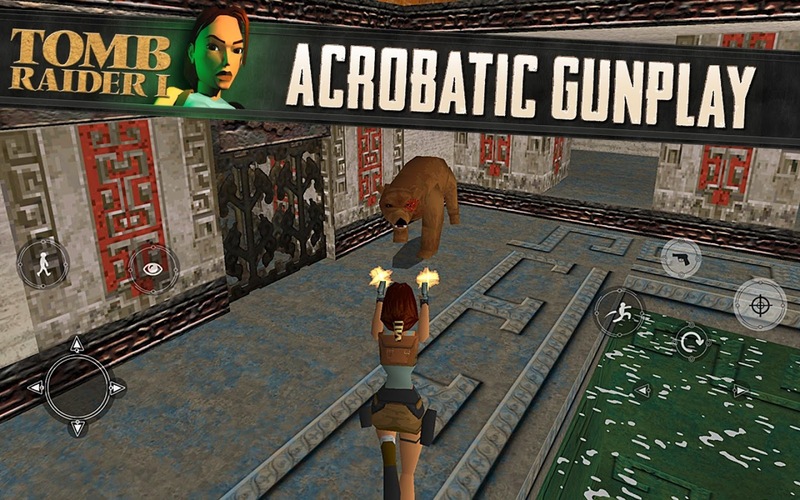 Acrobatic shots: deftly jumps around enemies while casting a hail of bullets with your two guns trademark. Face off against deadly predators: Atlantis centaurs defeat since the terrifying T-Rex. Mechanics original game: revives the full gaming experience, unedited and without modifying the classic game. Complete Chapters: includes two additional chapters were included in the 1998 game. Video cameras: compatible with MOGA Ace Power and Logitech PowerShell. And best of all, its price. Unlike other games like Dragon Quest VIII, this time Square Enix has decided to charge less than we could expect; so we can enjoy this wonderful play called Tomb Raider for just $0.99.